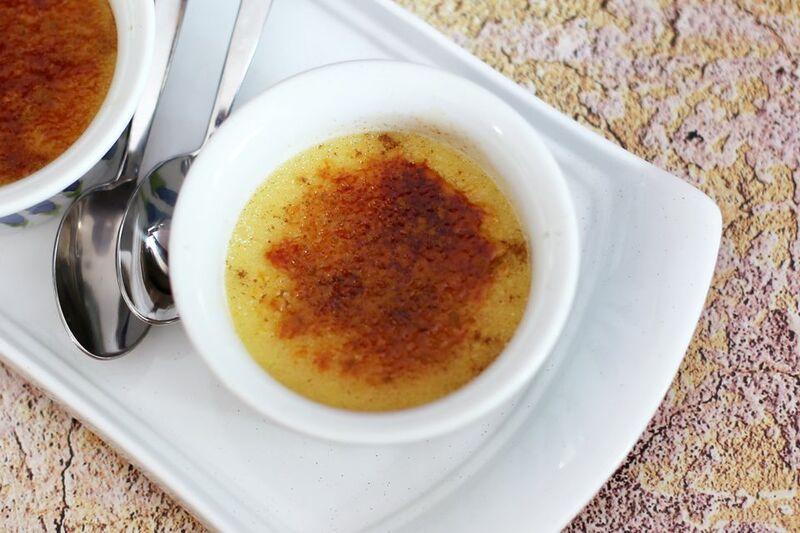 Plan this dessert early in the day or a day in advance to give the custards plenty of time to chill, Creme brulee can be frozen as well. Defrost them in the refrigerator and torch the sugared tops just before serving. I cut a medium butternut squash up, scraped out the seeds, then steamed it until very tender. Or cook the squash in the microwave or oven. Freeze any extra squash to use in soup or as a side dish. Heat oven to 300 F.
Place eight to ten 1/2-cup ramekins, custard cups, or oven safe demitasse cups in a large metal baking pan. In a medium saucepan, combine the heavy cream, half-and-half, brown sugar, cinnamon, nutmeg, and ginger. Heat over medium heat, stirring frequently, until the mixture just begins to boil. Meanwhile, in a small mixing bowl, beat egg yolks with the 1/4 cup of granulated sugar until thick and lemon-colored. Slowly add about 1/3 of the hot mixture to the egg yolks, whisking constantly. Add the egg mixture back to the saucepan, whisking constantly until thoroughly blended. Whisk in the butternut squash puree and the vanilla. Pour the hot mixture into the ramekins or cups, distributing evenly, about 1/2 to 2/3 cup per ramekin. Pour very hot or boiling water into the baking pan, so it is at a depth of about 1 inch, or about one-third to halfway up the side of the ramekins or cups. Bake for 45 to 55 minutes, or until the custard is set in the center, but not overly stiff. It will jiggle slightly. Remove the ramekins from the baking dish and place them on a rack to cool slightly. Cover them and refrigerate for at least 4 hours or overnight. Just before serving time, sprinkle about 1/2 to 1 teaspoon of sugar over each custard. Using a kitchen torch, melt and caramelize the sugar just until golden brown. Or place the ramekins on a baking sheet and put them under to broiler for 1 to 2 minutes, just until the tops are browned.